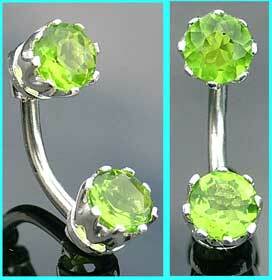 These belly bars are a twist on the classic double jewelled navel bar. The two claw set light green stones are 5mm in size, and one of the balls unscrews for fitting. Powered by ShopFactory to sell P11374 online. All-in one eCommerce and online shopping cart software.